SADDLE BROOK, N.J. (AP) - The battle for shoppers is playing out in this New York suburb: Wal-Mart versus everyone else. Dollar stores beckon, their small size ideal for quick shopping. Target offers 5 percent off if you pay with its store-branded card. Costco tempts with high-end, brand-name food and designer clothes at competitive prices. Bernadette Clark used to visit Wal-Mart here twice a week. Now it's twice a month. She got fed up last year when Wal-Mart stopped stocking some of her favorite brands and she couldn't count on low prices. "It gave me the opportunity to look elsewhere," she says. "I shop around more." Three years ago, Wal-Mart ruled for convenience, selection and price. But today it is losing customers and revenue, and smarting from decisions that backfired. Wal-Mart is not in danger of ceding its place atop the retail world. But competitors have begun to chip away at its dominance. Over the last year, revenue at Wal-Mart stores open at least a year has fallen by an average 0.75 percent each quarter, according to the International Council of Shopping Centers. Revenue rose by an average of nearly 1.7 percent at Target, 8 percent at Costco and 5.9 percent at Family Dollar. To fight back, Wal-Mart is again emphasizing low prices and adding back thousands of products it had culled in an overzealous bid to clean up stores. It's also plotting an expansion into cities, even neighborhoods where others dare not go. "We are running a better business because our competitors cause us to raise our own game," Wal-Mart CEO Mike Duke told The Associated Press in an interview. Wal-Mart expects to halt the decline in revenue when it reports results from its fourth quarter this month. Unlike most stores, Wal-Mart thrived when the Great Recession struck in late 2007. Its core customers - households making less than $70,000 a year - bought more. For many, it became the only place they shopped. Affluent shoppers became price conscious and discovered Wal-Mart's prices were hard to beat. All of Wal-Mart's $27 billion in revenue growth for the year ending in January 2009 came from greater demand for basic items - food, pharmacy and household goods. 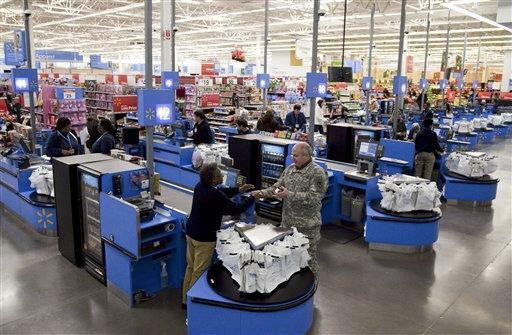 Shoppers spent 13 percent more on basics at Wal-Mart that year. Shoppers also liked that Wal-Mart's stores looked neater. The company was finishing a major renovation to address complaints that its stores were messy. Wal-Mart widened aisles, eliminated clutter, improved lighting and lowered shelves. Family Dollar and Dollar General posed little threat. Their stores generally were dingy, and their shelves were filled with low-quality clothing and housewares. The groceries weren't major brands. Target, meanwhile, struggled with the perception that its prices were high. And stores filled with non-essential items - think brightly colored, decorative pillows and kitchen accessories - didn't appeal to shoppers focused on making ends meet. So Wal-Mart had a competitive edge. It lasted until June 2009, the month that economists would later determine was the end of the Great Recession. Around that time, Wal-Mart's renovation started to backfire. As part of its store overhaul, it had removed thousands of products from its shelves. Gone were top-selling toothbrushes and other things that people counted on Wal-Mart to stock, like handkerchiefs. Wal-Mart got rid of 20 percent of its groceries, about 10,000 items in that area of the store, says Burt Flickinger, who runs the consulting firm Strategy Resource Group. Shoppers began complaining that Wal-Mart no longer had items they wanted, even some of their favorite brands. Revenue began to decline. "We cleaned the stores up, but we cleaned them up too much," says Duke, who had become CEO just months before, in February 2009. Wal-Mart's next mistake was pricing. Over the past year, it had strayed from its "everyday low prices" slogan, the bedrock philosophy of founder and namesake Sam Walton. Wal-Mart was less aggressive about being the low-price leader. Instead, the company slashed prices only on select products, and the deals were temporary. The idea was to draw customers into stores for the bargains and hope they would also pick up other, more profitable items. Last Memorial Day weekend. Wal-Mart advertised dramatic price cuts on 22 items, including a 40-ounce bottle of Heinz ketchup for $1, less than half price. The economy was still weak. Customers were scrutinizing prices as many had never before. They discovered that Wal-Mart couldn't be counted on to have the lowest price on some items, if it stocked them at all. Wal-Mart's mistakes have had a lasting sting. Shoppers are no longer confident that they can "take care of their shopping list on one trip and get rock bottom prices," says Robert Buchanan, an independent retail stock analyst. Revenue at Wal-Mart stores open at least a year, a key measurement of any retailer's health, has fallen for six straight quarters. That is the longest such stretch since at least 1980, when ICSC chief economist Michael Niemira began tracking the figures. Wal-Mart executives have acknowledged that fewer people have walked into its stores every quarter for the past year compared with the corresponding period a year earlier. While Wal-Mart has lost shoppers, competitors have gained. - Dollar stores are winning over customers with convenience. Their parking lots and stores are less than a tenth the size of those at most Wal-Marts. They stock eggs and milk in coolers up front near the registers. Bread is on a nearby shelf. That makes it easier for shoppers to get in and out quickly. They're carrying more major brands, especially food. Shoppers spend about the same as they did a year ago at Family Dollar - about $10 a trip on average - but they're coming in more often, the company says. Combined, Family Dollar and Dollar General took in about $20 billion in the last fiscal year, just 5 percent of Wal-Mart's $408 billion in revenue. But together they have thousands more stores than Wal-Mart, and their revenue is growing at an enviable rate. "The number of openings of dollar stores, and just the sheer density and convenience has been a (competitive) factor" for Wal-Mart, Duke says. "There's no doubt the customer wants value, but they also want convenience." Family Dollar's strategy is to blanket a region with stores, clustering them sometimes less than a mile apart and along bus routes. Dollar General has more than 9,000 stores and says it sees 12,000 more in its future, including plans for 625 this year. In Saddle Brook, Cindy Collins, 50, and her mother, Winnie, 71, could go to Wal-Mart for everything they need. But they favor the nearby Dollar General, which opened a year ago, for their weekly shopping. "We can get cereal, paper products, cat food or whatever we need here. It's also easy to get in and out," says Cindy, who lives in nearby Elmwood Park. - Target scored a win against Wal-Mart with its 5 percent discount for purchases paid with a Target credit or debit card. The incentive, launched in October, applies to everything sold in its stores, from toys to fast-selling iPads. Wal-Mart won't match the discount, even though it's losing customers like Tomacinia Carter. She lives closer to the Wal-Mart in Saddle Brook, but chose to shop a Target in Paramus because of the discount. She saved $4.60 on a recent trip. "It does add up over time," she says. "That is hammering Wal-Mart," says Craig Johnson, who runs the consulting firm Customer Growth Partners. Duke says loyalty and credit card programs are expensive to run and Wal-Mart wants to give low prices to all shoppers. Target is Wal-Mart's largest rival, though its revenue of $65 billion for its last fiscal year was only one-sixth of Wal-Mart's. Target has maintained its reputation for stylish clothes at low prices. It's also added fresh fruits and vegetables to an expanded grocery section. - Wholesale clubs, particularly Costco, weathered the recession and are picking up Wal-Mart customers, too. Shoppers are drawn by things like premium beef at competitive prices and well-known brands, such as coats from designer Michael Kors that are offered at steep discounts and in limited quantities. Wall Street Strategies analyst Brian Sozzi describes shopping at Costco as a "treasure hunt." Costco's membership, which includes small businesses, grew by 2 million to 58 million last fiscal year. Customers shopped its warehouses more often and spent about 2.5 percent more on each visit than they did in 2009, the company says. Wal-Mart hopes the holiday season marked the end of the declining revenue. Analysts surveyed by Thomson Reuters expect Wal-Mart to report a 0.9 percent increase in revenue for the November through January quarter. Wal-Mart will release its quarterly and year-end results Feb. 22. - Going beyond the return to "everyday low prices." Wal-Mart upped the ante in the fall by pledging to match competitors' prices. The company is also pressing its suppliers to give it the lowest prices on goods including clothes, food and cosmetics, says Cameron Smith, a recruiter for Wal-Mart vendors. - Restocking thousands of grocery items. It plans to finish adding back products to all its departments by spring. - Revamping its clothing department to focus on basics like socks, underwear and no-frills jeans, which are selling better than other clothes. - Collaborating with suppliers to offer products in smaller sizes, most for under a dollar. - Opening more smaller stores. Some will be less than 30,000 square feet, about a sixth of the size of the average Wal-Mart store. These will be in towns the company figures can't support a big-box store, in an effort to go head-to-head with dollar stores. The company is also looking to follow the success of Home Depot and Target by moving into urban areas. It's already moving into Chicago, and is looking at sites in Washington. Duke says Wal-Mart has its eye on New York, too, where Wal-Mart calculates that city dwellers using credit cards spent $165 million at Wal-Marts in the suburbs last year. And Wal-Mart plans to tap markets where no one else goes. Duke calls them "food deserts," city neighborhoods where the few places to shop have limited products, few healthy options and high prices. "We have an opportunity here to grow our business, to serve more customers, to open stores, and that is something we are positive about," Duke says. Wal-Mart still faces obstacles. Rising gas prices and high unemployment hurt Wal-Mart's working-class customers. Soaring prices for commodities may make groceries more expensive for the retailer. But the company has righted itself before. Underestimating Wal-Mart would be a mistake, warns Joe Feldman, a managing director at Telsey Advisory Group, a research company. "The company always figures it out."